East of the Mississippi, the following list of names represent the final Confederate soldiers to formally and officially surrender to the Union army. 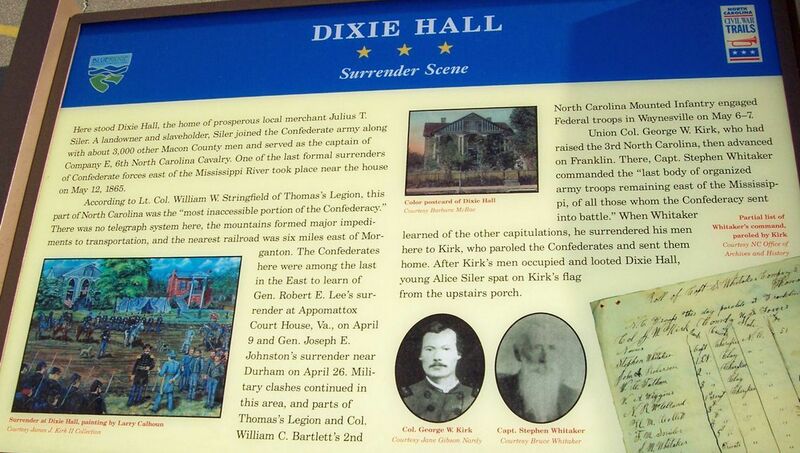 The surrender occurred on May 12, 1865, at the Dixie House in Franklin, Macon County, North Carolina. The last or final official Civil War surrender refers to the organized unit of gray-clad soldiers employed in service of the Confederacy and not to a band of bushwhackers or guerrillas operating as an autonomous unit. For authenticity, original spelling is intact. Recommended Reading: Storm in the Mountains: Thomas' Confederate Legion of Cherokee Indians and Mountaineers. Description: Vernon H. Crow, Storm in the Mountains, dedicated an unprecedented 10 years of his life to this first yet thorough history of the Thomas Legion. But it must be said that this priceless addition has placed into our hands the rich story of an otherwise forgotten era of the Eastern Cherokee Indians and the mountain men of both East Tennessee and western North Carolina who would fill the ranks of the Thomas Legion during the four year fight known as the Civil War. Crow sought out every available primary and secondary source by traveling to several states and visiting from ancestors of the Thomas Legion to special collections, libraries, universities, museums, including the Museum of the Cherokee, to various state archives and a host of other locales for any material on the unit in order to preserve and present an accurate and complete record of this unit. Crow, during his exhaustive fact-finding, was granted access to rare manuscripts, special collections, privately held diaries, and never before seen nor published photos and facts of this only legion from North Carolina. Crow remains absent from the text as he gives a readable account of each component that comprised the Thomas Legion, and he includes a full-length roster detailing each of the men who served in its ranks, including dates of service to some interesting lesser known facts. Storm in the Mountains, Thomas' Confederate Legion of Cherokee Indians and Mountaineers is presented in a readable manner that is attractive to any student and reader of American history, Civil War or North Carolina studies, Native Americans and Cherokee Indians, ideologies and sectionalism, and I would be remiss without including the lay and professional genealogist since the work contains facts from ancestors, including grandchildren, some of which Crow spent days and overnights with, that further complement the legion's roster with the many names, dates, commendations, transfers, battle reports, with those wounded, captured, and killed, to lesser yet interesting facts for some of the men. Crow was motivated with the desire to preserve a niche history that had long since been overlooked and forgotten and by each passing decade it continued to sink deeper into the annals of obscurity. Crow had spent and dedicated a 10 year span of his life to full-time research of the Thomas Legion, and this fine work discusses much more than the unit's formation, its Cherokee Indians, fighting history, and staff member narratives, including the legion's namesake and commander, Cherokee chief and Confederate colonel, William Holland Thomas. Numerous maps and photos also allow the reader to better understand and relate to the subjects. Storm in the Mountains, Thomas' Confederate Legion of Cherokee Indians and Mountaineers is highly commended, absolutely recommended, and to think that over the span of a decade Crow, for us, would meticulously research the unit and present the most factual and precise story of the men, the soldiers who formed, served, and died in the famed Thomas Legion.